Award winning AQUAMAX high efficiency gas hot water systems keep your whole team in steaming hot water all year round. Energy efficient Mains Pressure Hot Water that keeps you up with any demand you throw at it. AQUAMAX hot water systems are built to last using the latest technology and backed by a 10 YEAR STAINLESS STEEL CYLINDER WARRANTY. With their new release FIVE STAR PERFORMERS, the AQUAMAX 340 litre and 390 litre models, you’ll always have hot water when you need it most. Their stainless steel cylinder out performs any domestic storage or continuous flow hot water system in the market and comes complete with a 10 YEAR CYLINDER WARRANTY. The flagship model AQUAMAX 390 has a massive 390 litres available in the first hour and 185 litres per hour recovery so you’re unlikely to ever run out of hot water. These mains pressure hot water systems can keep up with the highest demand, even when you turn on the second, third or forth tap, the hot water flow remains constant. With AQUAMAX you’ll get a more rapid and finer response at the hot water tap than any continuous flow system. The only water heater of its type with a five star energy rating, the AquaMAX 135 litre gas hot water heater offers water saving advantages whilst using the least amount of gas possible. The AquaMAX 135 litre gas hot water heater is a compact size water heater featuring the latest burner technology for maxium efficiency. Using a stainless steel burner this heater has no central flue resulting in energy efficiency second to none. The Aquamax 135 litre is built to last using the very latest technology and backed by an unprecendented five year cylinder warranty. 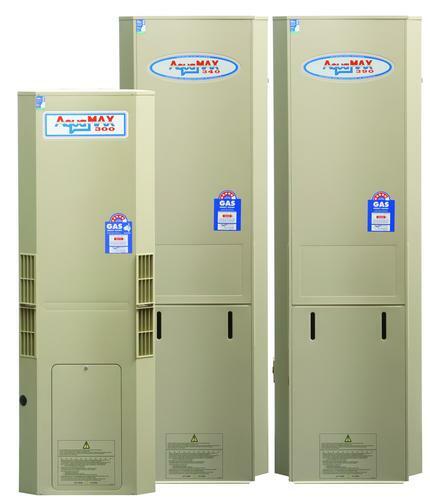 Aquamax's award winning Solarmax systems offer significant financial and environment savings with boosted capacity that will ensure you never run out of energy efficient hot water. Our gas 135 litre water heater has the capacity to be upgraded to a Solarmax system with the simple addition of a storage tank, control box and panels. So if your still not sure on going solar or you just want to spread the cost, Aquamax gives you the freedom to upgrade your system at your pace. Our service vehicles are fully equipped to carry out hot water repairs and replacements to all Aquamax Hot Water Systems, Hot Water Heaters, Hot Water Tanks and Hot Water Units including all major brands like Rheem - Vulcan - Bosh - Dux - Pyrox and more. We offer hot water solutions tailored to suit your changing needs and are an accredited service and warranty agent for all leading brands of gas hot water systems. Best of all we guarantee quality service at competitive prices. Turn to us for free advice and quotations for your new hot water heaters or hot water units and receive prompt attention from our experienced and qualified staff. Flo-Rite Plumbing can also supply and install the latest Solar Hot Water Systems, as well as the 5 star energy efficient range of Gas Hot Water Systems and the latest models in the very economical range of Heat Pump Hot Water Systems. Our reputation has been built on providing prompt, quality service at competive prices. If you need our plumbing services Brisbane or our plumbing services Gold Coast, or want to install an insinkerator or garbage disposal unit, clear a blocked drain, repair a leaking tap, fix a burst water pipe, replace your faulty hot water element, have a backflow valve tested, do some gas fitting repairs, fit a new hot water circulating pump, supply and fit a hot water thermostat, fit a newhot water anode, replace or fix a leaking toilet, install a new boiling water unit , we guarantee our friendly and courteous hot water and plumbing staff are committed to fixing all your plumbing, drainage, gas fitting and hot water problems first time every time.